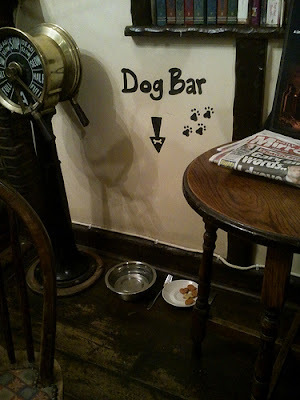 One of your author's general rules of thumb is that a good pub is one that allows dogs and forbids children, and so it was welcome to find that one South East London pub has taken canine hospitality to new levels, with the installation of a Dog Bar at the Pilot Inn, North Greenwich. Sure, it is only really a couple of dog bowls, but there is something rather civilised about encouraging dog walkers to drop into your pub, and providing sustenance for their four legged friends. The Pilot itself is a great little pub, two centuries old standing surrounded by wasteland and building plots near to the Millennium Dome. Totally Agree. Pubs are no places for Children for so many reasons and a pub with a dog or cat is simply perfect. What a fantastic idea...unfortunately, we do allow the kiddies.